What it does - The Inventory Summary is a good way to easily view and print the on-hand quantity of your inventory items. 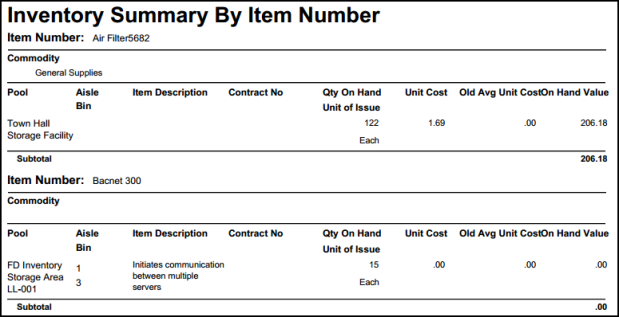 This report provides the unit cost for each item, the unit of issue, and the on-hand value. Why it's great - The Inventory Summary report can be used to meet a few needs: 1) The report can be used as a "snapshot" of the on-hand quantities for inventory items and 2) The report can be set up to help manage dead inventory by indicating items that have not been issued within your designated reporting period. Enter the criteria for your report, making sure to select Summary Report in Step 14. What it does - The Issue Detail allows you to report and stay on top of the items issued to your various locations. The report includes not only the item number and quantity issued, but the pool it was issued from, the unit of issue, the unit cost and the transaction total. Why it's great - This high-level report is a great tool to manage the total inventory cost accrued for each location, but also takes it a step further and provides an actual breakdown of the items that have been issued to each location, the quantity, date, etc. Enter the criteria for your report, making sure to select Detail Report in Step 17. What it does - The Receiving Detail provides a nice roll-up for each of your organization's suppliers. The report breaks out the individual items your have received, the quantity received, and calculates the total inventory cost received per item as well as per supplier for the given reporting period. Why it's great - This is a great report to show how much your organization is spending at the vendor level. The Receiving Detail can also be leveraged to aid in future reorders of inventory items. Click on the Receiving tab, and then Print My Receivings from the shortcuts section. Enter the criteria for your report, making sure to select Detail Report in Step 13. What it does - The Catalog is another quick method to view inventory items. The Catalog is broken down by the eight different inventory types available in InventoryEdge and the Commodity sub-categories you have created. You have the ability to view a table of the available items and their current on-hand level. Why it's great - The Catalog is a handy option because with just the click of your mouse you can filter the list of items to display the inventory items associated to a specific commodity of choice. The Catalog also provides a print option. Select a Catalog to view and then click Print Catalog. Select Commodities and/or Pools to narrow your report results.